What is the ASEAN "Fire Alert" Tool? Each day, satellite imagery provides us information on hotspots in the ASEAN region. Using such data collated by the ASEAN Specialised Meteorological Centre (ASM), together with online databases and mapping technologies, we are able to alert you, via your Android Phone App, if an area of interest to you has a hotspot registered on or adjacent to your land. You can also select locations (points on the map) to be your Registration Points for monitoring changes based on the Fire Danger Rating. When any of these coordinate points rises or lowers in Fire Danger Rating (based on the Fire Weather Index - FWI), you will be sent a push notification alerting you. Login to your account and update your database with Registration Points (details on FWI here). 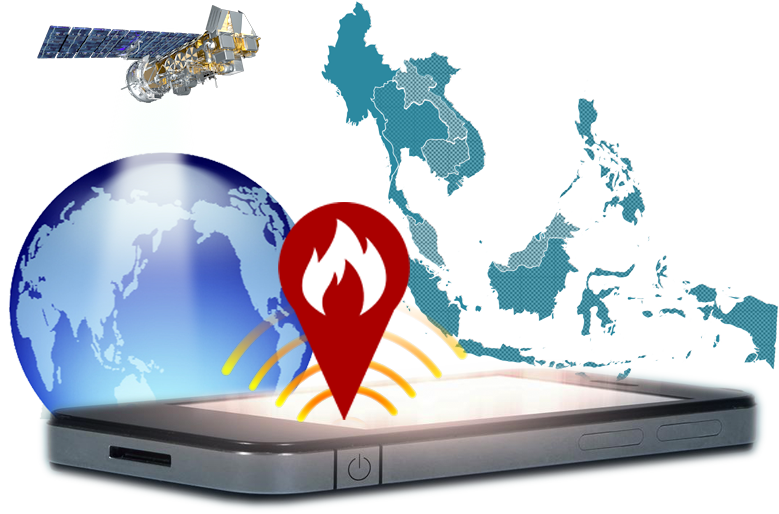 The objective of the ASEAN Fire Alert Tool is to provide every land manager with the ability to be alerted as soon as a hotspot is present on or adjacent to your land. You don’t have to go to a website every day and look for hot spots, these will automatically be notified to you via Push Notifications to your mobile smartphone and only then do you need to confirm where it is and begin your validation of the hotspot. Once you’ve registered you will be able to view a mapping screen where you can digitally select parcels of land that either you own or you are interested in monitoring for hotspots. You can select and name up to 20 separate parcels of land. A parcel of land can be as large or as small as you like. If a hotspot occurs on or adjacent to you land, an alert (push notification) is sent to you via our phone app, once a day at approximately 7:00pm (GMT+8). It’s that simple. The benefit for the land owner is that you will be alerted to a hotspot rather than you having to scour hotspot web sites and determine whether a hotspot is near your land or not. This web site and linked phone app do that daily routine work for you. ASMC hotspot data is published daily by the Meteorological Service Singapore. LAPAN hotspot data is published by the Indonesian National Institute of Aeronautics and Space. Each day at a pre-determined time, our software programme automatically visits and reads these hotspot data, displaying them as points on a map (view sample map here). Through this website users are able to plot boundaries surrounding regions of interest or land parcels on a map. We match these two sources of data and trigger alert messages to registered users through our phone app. FDRS data (Fire Weather Index, FWI) is obtained from the Malaysian Meteorological Department (details on FWI here) and we report changes to the FWI rating of all your locations daily as well. Our software programme automatically visits the ASMC site and LAPAN site once a day, at a pre-determined time** and reads published pre-formatted data "as is". This information forms our daily set of hotspot data. Land parcels are drawn as 'regions' by registered users (accuracy determined by the map zoom levels).